“Behold, the former things are come to pass and new things I now declare: before they spring forth I shall reveal them to you” (Is. 42:9). The new is not always familiar. Like traveling to a foreign county, it takes time to adjust to a new culture. The response of the “new thing” by some is to serve it before it is ready. New wine must be seasoned before it is ready to serve. Not many people prefer grape juice, although sweet to the taste, it doesn’t contain the same “spirit” that seasoned wine contains. Others disregard the new preferring to remain in old familiar ways. Others, based on fear, will compromise in order not to offend anyone. Change requires faith and patience with a willingness to navigate through the prophetic process that opens the gates for the invasion of heaven (He. 6:12). The Lord’s Prayer to His heavenly Father is “Thy Kingdom come on earth as in heaven.” The gospel message and ministry of Jesus revealed the Kingdom of God. The Holy Spirit is transitioning His people from Church life to Kingdom life. Change requires courage. As the Lord exhorted Joshua during the time of transition from the desert to the promise land, “Be strong and of good courage, be not afraid, not be dismayed: for the Lord your God is with you wherever you go” (Joshua 1:9). 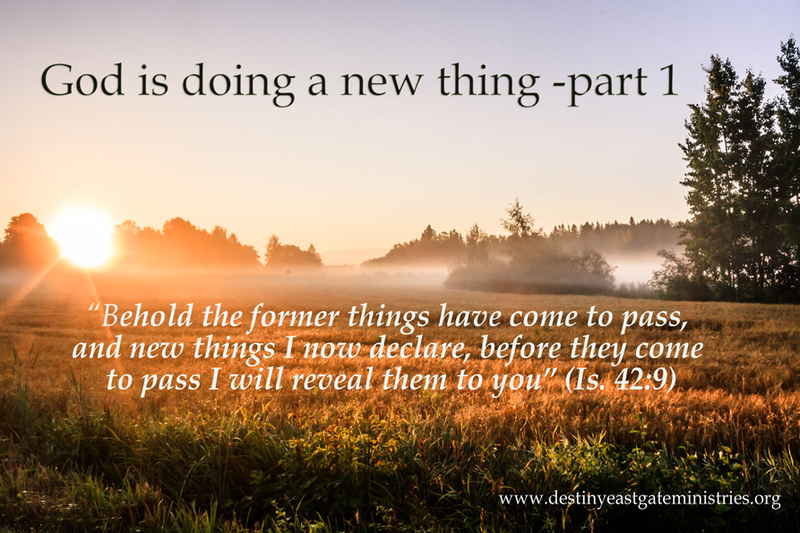 God loves to do “new things.” In Genesis God brought forth a new creation. He then created mankind in His image and blessed them to cultivate the Garden of Eden. An angel revealed to Mary the Holy Spirit will come upon her and she shall conceive a child- the savior of the world (That’s real change). John came as a “voice crying in the wilderness” baptizing the people calling for repentance. Jesus did all things new. He walked on water, feed the multitudes, healed the sick and raised the dead. Jesus is our example for New Testament life and ministry. Breaking the traditions of the religious leaders, Jesus came as the creative expression of God that did “new things” that we may know the love of the Father. He then tells us that greater works shall we do in the power of the Spirit. Formality is the enemy of creativity. Embracing tradition and our personal preferences hinders true spiritual growth. Instead of Kingdom life and prosperity, God’s people live in poverty. As sons and daughters of the Creator, we are created in His image to prosper with signs and wonders in the freedom of the Spirit. “The Lord is that Spirit, for where the Spirit of the Lord is, there is liberty – 2 Cor. 3:17. God is not abolishing divine truths. The Scriptures are eternal. God is bringing Scriptural truths to light, the revelation of Christ that expands our horizon. He is opening the eyes of our heart that we might see the knowledge of Him, to know the hope of His calling, the greatness of His power and the riches of His inheritance that is ours in Christ (Eph. 1:18) “For it is Christ in you the hope of glory” (Col 1:27). His passion is that may be one just as He and the Father are one (John 17). The “new thing” begins with a prophetic voice declaring the revelatory passions and will of the Father (Ps. 2:7). This is followed by intercessors pushing the issue to birth it. The leadership then takes a position to implement a breakthrough. The teachings, intercession, new songs in worship, all declare as one that which God desires to bring forth in the unity and power of the Spirit. It’s time to declare new things. As in Ezekiel’s graveyard, (37:10) the Lord is looking for those who will prophesy His purpose. In doing so, a fresh breath of the Spirit will revive the dead bones that they may come together as God created and set each one in the Church as it has pleased Him (1 Cor. 12:18). The wind of the Spirit will bring new life to His people. As the revived army of the Lord, being led by the Lord of Host, they will march victoriously to make a great advance. The call of every believer is to rise and shine with the light of His glory (Is. 60:1). We are living in exciting times and it has just begun.